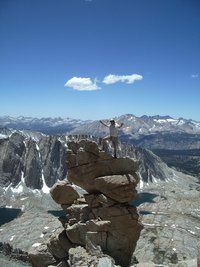 Steve Fausset = The Wild S.
Hosted by Steve Fausset = The Wild S.
Either of 2 places: 7:30 AM @ Christmas Circle in downtown Borrego Springs ... or 7:55 AM @ Villager Peak trailhead, mile marker 31.9 Nth side Hwy S-22 about 13 miles east of Borrego Springs town. Bring: 4 quarts or liters of H2O with electrolytes minimum (you may need a bit more if you're a heavy drinker who goes through more than others on hikes), snacks to eat WHILE MOVING, lunch for the peak stops, layers (jacket or wind breaker, down or fleece, beanie, gloves, etc), hat / sunglasses / sunscreen, plastic comb & tweezers for getting any cactus out, headlamp or light with fresh batteries just in case, any first aid or "drugs" you need, poles & gaiters are helpful, etc. Pre-hydrate by drinking Sat. AM & on the drive out. My Hiking Style: we'll stay together as a group for both camaraderie & safety; we snack & drink while we move except for short bathroom breaks or to take pictures from time to time along the way; I'll take a 1/2 hr or longer break at the 2 peaks to eat "real" food / sign registers / enjoy the 360 views; I prefer to hike at a steady, bit faster then average pace over the course of a long off-trail desert day & evening. Contact me ahead of time if you have Q's:[masked] cell or via meetup messaging. 1. *WAIVER OF LIABILITY: This group, its organizer, assistant organizers, event organizers will not be held responsible for any injuries or accidents that may occur carpooling to and from hikes, or for any injuries or accidents before, during, and after group hikes. If you sign up and come on this hike outing you are acknowledging that you freely and voluntarily assume all risks of injuries and damages and agree to participate in the hike/outing. 2. Please no +1s or guests - all attending must be group members who are signed up for this hike. This is for liability reasons & to allow me to see each person's profile to get a feel for the group before the hike. Fausset = The Wild S.